My first task was to do the basic design of the game, and then try to procure the cheapest parts I could, which would then drive the final design of the circuit and layout of the PCB — though I already knew that I wanted the PCB to look like a retro video-game controller. After finding the basic parts, I went on a search for a cheap processor. I decided on a PIC 16C620. It was small with 18 pins, and had a useful amount of memory. Most importantly, I could get a bunch of them cheap! Since the game is simple, very few I/O pins were necessary. In fact, one remained unused ... which never happens in any of my projects. Power: As my concerns were more with cost than efficiency, the power section of the circuit uses a 7805 five volt regulator that converts the nine volts from the battery. The regulator is old technology that you can get very cheaply, but it uselessly dissipates a bunch of heat when in use. You should notice fairly quickly that there is NO power switch for the RetroGame. To turn it on, you plug in the battery connector. Eliminating the switch saved some money and the kids loved the hands-on feel of plugging in the power. Input: Two momentary push buttons pull two input pins of the PIC controller to ground when pressed. Otherwise, pull-up resistors (R9, R10) pull them to +5V. 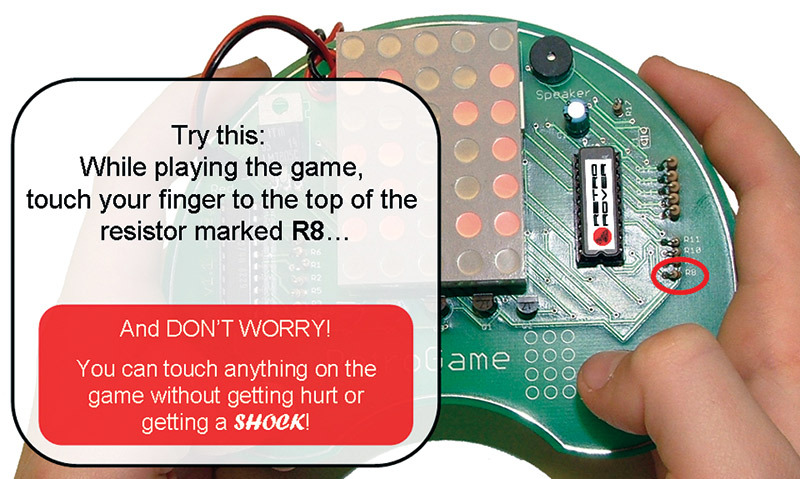 These pushbuttons are the only user input for the game. I used cheap switches which “bounce” quite a bit. The software deals with this issue. I briefly considered adding a third pushbutton (because I already knew I wanted to create Retris and wanted rotation) but abandoned the idea in favor of simplicity. 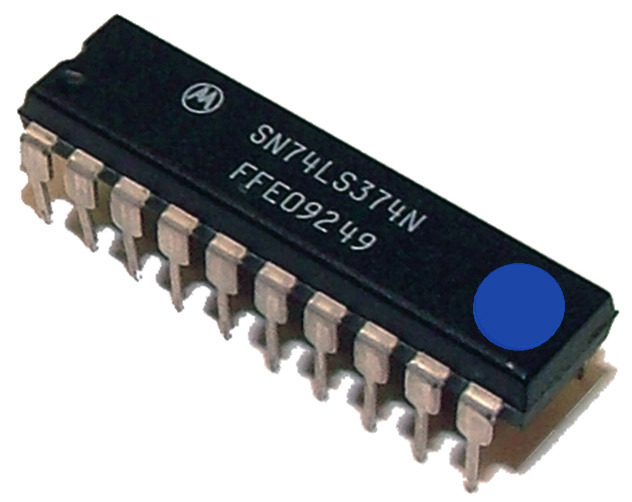 Processor: The processor section consists only of the PIC 16C622A (the generic 16C620 is shown in the schematic). Note that the internal oscillator is being used for the clock. Since this is just a video game, the precision of a crystal-controlled clock is unnecessary. Note, too, that in the schematic that C1 can be left out. I left it out for the kids; you’ll see why later. 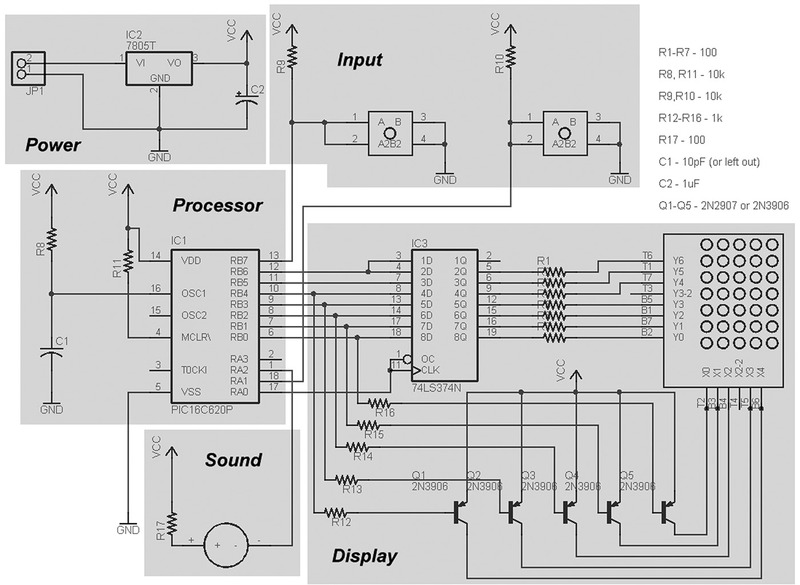 Display: The most complicated part of the circuit is the LED display section. It consists of the 5x7 LED matrix along with a data latch and transistor column drivers. The LEDs on the matrix are rapidly flashed, as described in the section on RetroGame Display. The circuit was originally created on a breadboard, which allowed experimentation mostly on the display section. It also allowed me to begin software development while I waited for the PCBs to be manufactured. 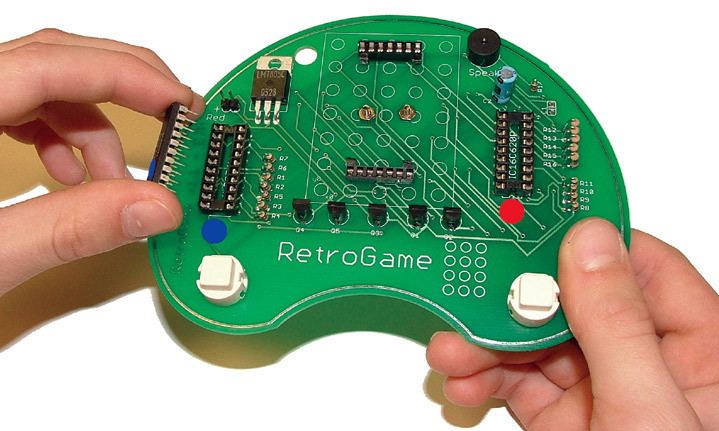 Arguably, the coolest part of the RetroGame is that you play it while holding on to the PCB itself which is shaped like an old video game controller. The silver strip running around the circumference of the PCB is just for looks. Creation of the PCB was relatively simple. 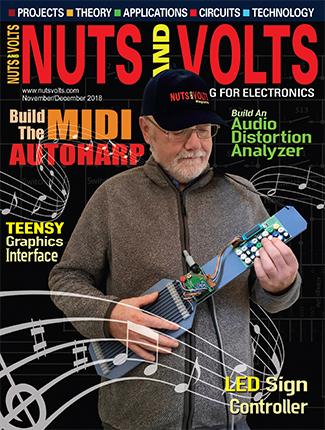 I used the Eagle editor for a simple two-sided through-hole design with parts on one side only — almost. The battery holder is attached to the back of the RetroGame with two screws and nuts. Although it’s obvious that no components could be soldered where the metal battery holder was placed, what wasn’t obvious to me at first is that the vias from top to bottom needed to be kept away from the holder area too. I could count on the PCB solder mask to prevent short circuits due to the battery clip contacting traces, but I couldn’t count on it to protect the vias. So, I set up the battery holder area in the design to exclude vias ... simple. Populating the PCB was easy with the through-hole design. The only interesting detail is that the major components were to be socketed, allowing the kids to be involved in the assembly. The display driver and the PIC would have normal sockets. The LED matrix, however, needed something special — two single row, seven-pin sockets. If you haven’t looked lately, those things are expensive. Instead, I simply cut a 14-pin socket in half. The socket for the display also served to keep the display away from the screws that attached the battery holder to the back of the PCB. You may notice that there is no heatsink on the 7805. There probably should be, but the circuit doesn’t draw too much power, so in practice it doesn’t get too hot. To mitigate the potential for a kid to burn a finger, I mounted the 7805 flat against the PCB. The RetroGame was done in plenty of time for Science Day, although I still had quite a bit of work to do to get ready for the kids. One important issue that I wanted to prevent was potential incorrect orientation of the ICs. The display wasn’t a problem in that it can be mounted in either orientation. To solve the PIC orientation problem, I simply used little colored stickers. The PIC had a red dot on it (which doubled as the game label) and the 74LS374 had a blue dot on it. 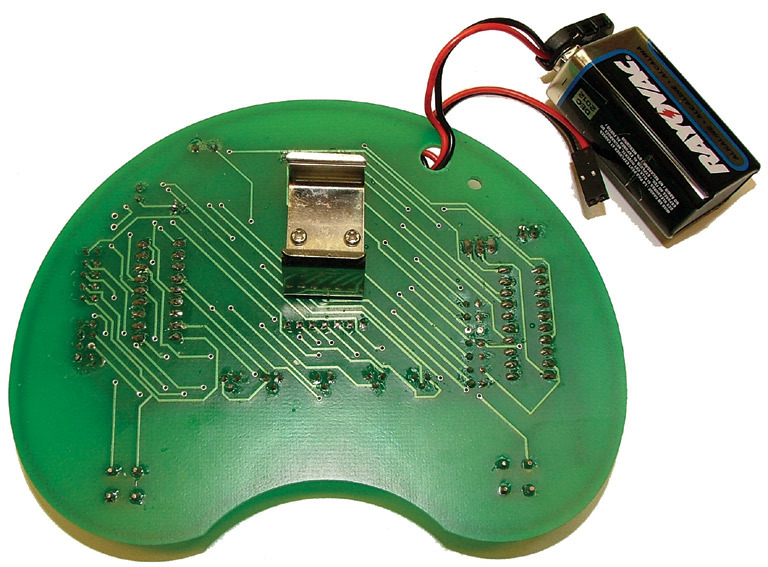 The dots were strategically placed on one end of each chip, and a matching dot was placed on the PCB itself. The kids just had to line them up! Science Day went great! We had 100% success rate with 65 third through fifth graders assembling and playing their own video game. There were a few problems (like bent pins) and a couple resultant messed up sockets, but spare parts solved the problems. Remember that I didn’t recommend installing C1 in the final RetroGame? 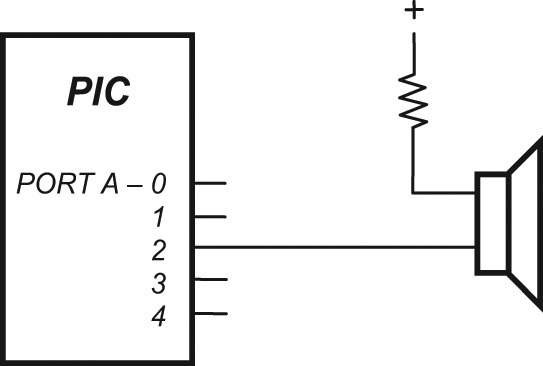 C1 is the capacitor that helps set the frequency for the internal PIC oscillator. By not installing it, I found that you could easily affect the speed of the clock with your finger. In fact, you could slow the game down dramatically to the point where you could see the flashing of the display, and the game itself would operate so slowly you could get yourself out of problems. I was somewhat surprised by how quickly the kids were able to take advantage of this little trick! One student even figured out how to lay his finger on the underside of the board when he needed it. The display for the RetroGame is a row cathode, column anode LED matrix. 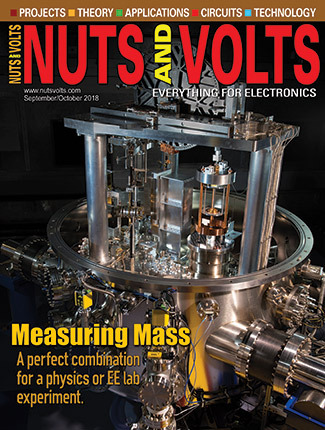 At first glance, you may ask yourself, how do you individually drive 35 different LEDs with only 12 signal lines? Fine question. As the name implies, the display is a “matrix” of LEDs. The cathodes (-) of each LED in a given row are connected together, while the anodes (+) in a given column are connected together. 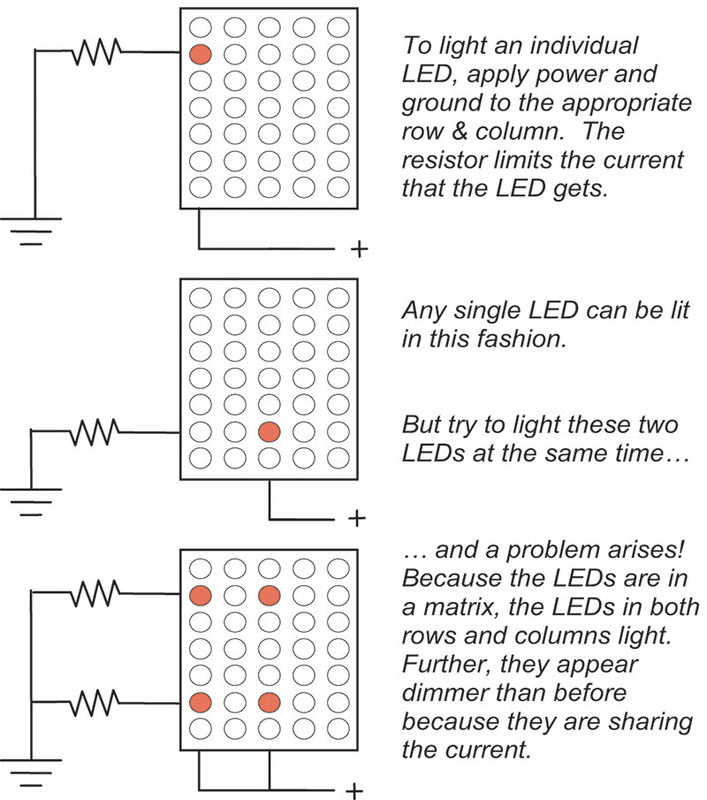 To turn on an LED, you apply power and ground to a row and column, respectively (through a resistor). So, to use an LED matrix a standard “trick” is employed. The trick is to only light one column of LEDs at any one time, and to rapidly cycle through the columns giving the illusion that two LEDs in different columns are on at the same time. The rows are then synchronized with the particular column that is being “lit” at any one time. 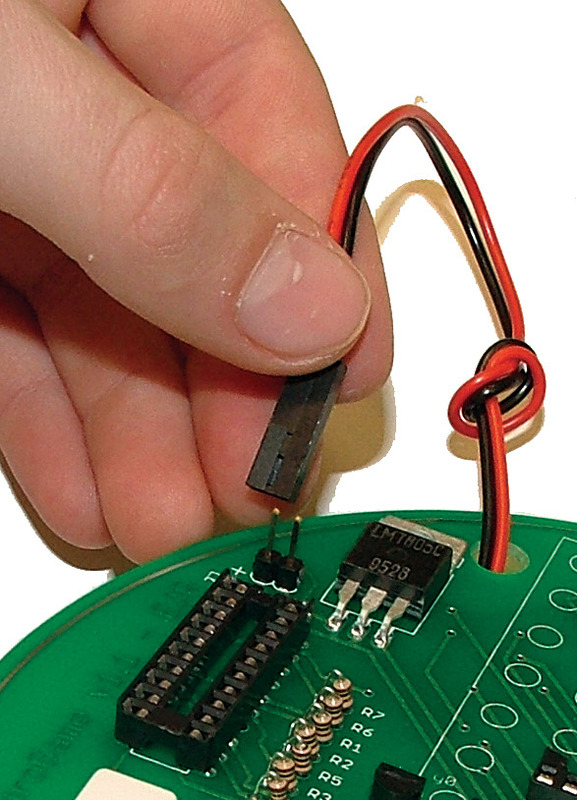 Do this over and over — and fast enough — and any set of individual LEDs can appear to be on at the same time. 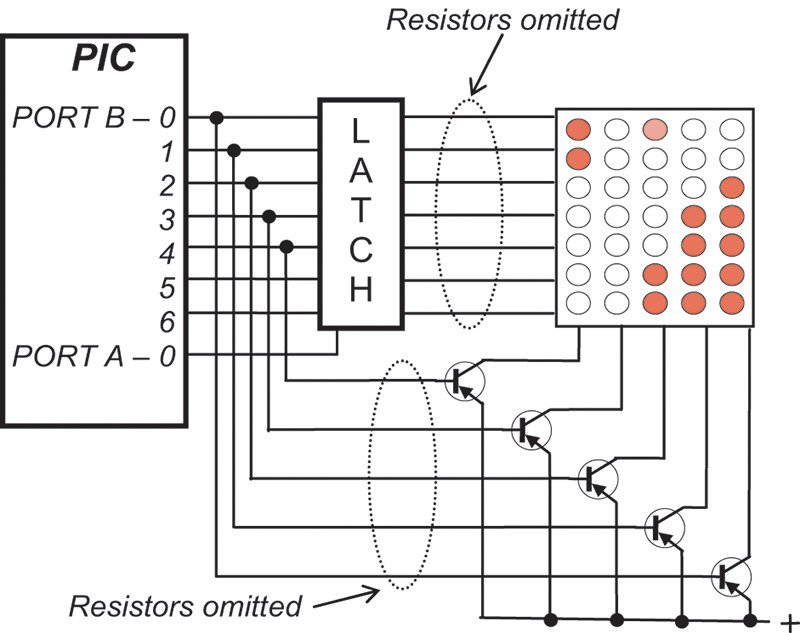 The diagram in Figure 12 is a simplified (though not by much) schematic of the LED matrix in the RetroGame. The resistors have been removed to make it look less cluttered for this discussion. 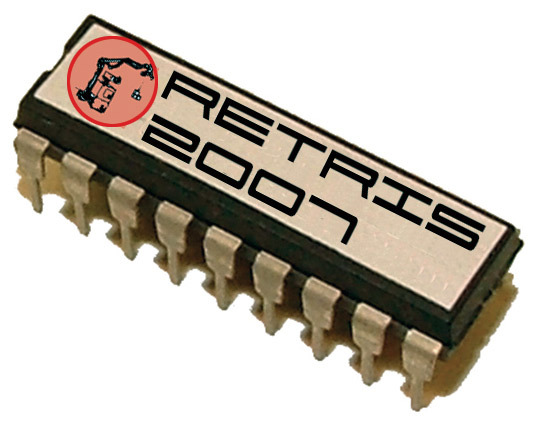 In the RetroGame, the columns are driven by transistors, one of which is on at any point in time. The rows are driven by data that is latched into a data latch. Place the first column data on port B lines 0 through 6 (seven bits). This data corresponds to the particular LEDs which should be lit in the first column. Drive port A bit 0 high, which is connected to the data load line of the latch. This both latches in the column data, and holds the latch output lines high while the line is held high — effectively “blanking” the matrix. Set the column number (the first column in this case) data into port B lines 0 through 4 (five bits). This will turn on the associated column transistor. Finally, pull port A bit 0 low, which allows the previously latched column data out on the latch output lines, lighting the target LEDs in the first column. Leave the display in this state for a bit and then start over at step 1 with column 2 data driving the column 2 transistor, followed by column 3 — and so on. After lighting column 5 LEDs, the process starts over at column 1. Do this fast enough and a human observer won’t see any flashing. Source code files used for the display are display.asm,display.h, and display.mac (available in the downloads). To generate sounds and music, the RetroGame uses a technique called bit banging. This quaint little term describes the brute-force method of manually raising and lowering a signal line (bit) to generate a particular shape of signal over time on the line. In the case of the RetroGame, the signal is a certain frequency of music or sound. Normally when you see a representation of a sound, or the “waveform” for a sound, you see something like what’s shown in Figure 13. By adjusting the time the PIC waits between the raising or lowering of the sound line, different frequencies can be produced. In the RetroGame circuit, the signal line that generates the sound is connected directly to the speaker, with the other end of the speaker connected through a resistor to +5V (Figure 15). There is a problem with bit-banging like this. While the PIC is generating a sound or music, it can do very little else. In essence, it has to give its full attention to generating the sound. Granted, with some very judicious programming, the time spent waiting between the raising and lowering of the sound line can be used to do other things. 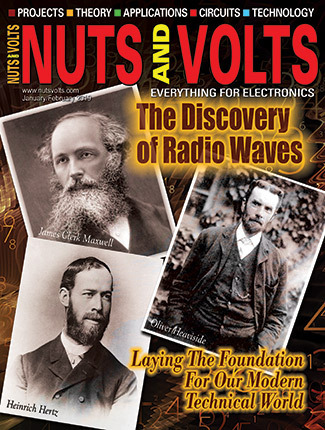 This isn’t easy, particularly given that music is far more interesting with different frequencies — some of them quite high. 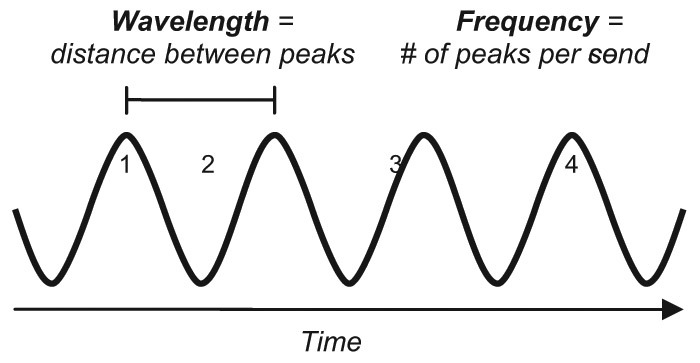 Plus, high notes have much less wait time between signal line transitions. The RetroGame can play two things: music and beeps. To play music, it stops doing everything else, including updating the display. As such, whenever music plays, the display blanks. To make beeps, it is actually smart enough to use the extra time to update and move the display. Source code files used for music and sound are music.asm, music.h, music.mac, musicdata.asm, musicdata.h, and musictable.mac (also available in the downloads). 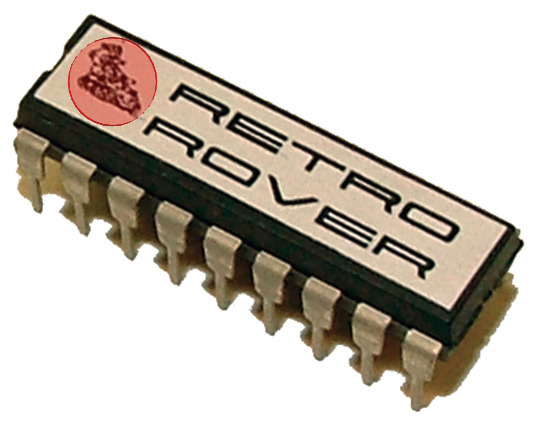 The RetroGame circuit is relatively simple, but the software is somewhat more complicated — not too complicated though, and it is pretty small, fitting into a PIC 16C622A. Changes and updates the display (for text or game play). Plays beeps and “non music” sounds. During each round through the loop, a small bit of each software module runs before it returns to the main loop. Each module gets a turn during the loop,accomplishing a small piece of its task and keeping track of its position for the next round with a state machine. The main loop includes a delay which sets the speed of the game. The only thing that occurs during the delay is the production of sounds. music.asm (.h): Implements the music playing routines, though none of these routines are called directly. Instead, the macros in music.mac are the interface to music by other modules. music.mac: Implements the macro “MusicScorePlay” which will play the given musical score. Note that music.mac automatically includes musictable.mac. musictable.mac: A very large macro that interprets a musical score, setting the appropriate values for the desired note. Note that this entire file is generated by a C program that takes into account the clock speed of the PIC. 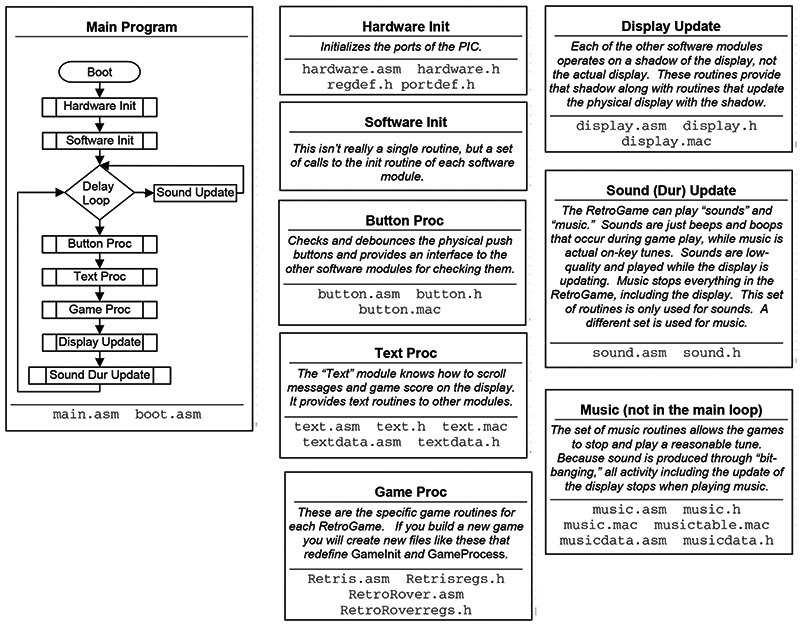 musicdata.asm: Musical scores for “standard” game music are in this source file. 1* The musical note: C, D, E, F, G, A, B, or R for a rest. 2* Modifier for sharp or flat: # or b. 3 Octave – from 0 (zero - low) to 8 (high). 4 Duration from 0 to 3. 5 Set to 0 (zero) for smooth and 1 for staccato. *Fields 1 and 2 must be enclosed in quotes. The MusicNoteTableEntry macro creates two lines of code per macro. The Dirge score above, therefore, occupies 22 instruction slots, plus two for the MusicNoteTableDone macro. In other words, each musical score with N notes occupies 2(N+1) instructions slots. 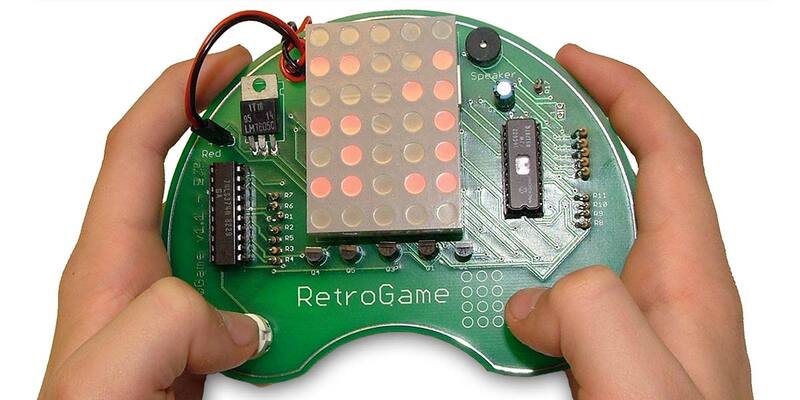 The Retro Game is Fun to Build and Fun to Play. Demonstration of the RetroGame running the Retris 2007 game. Note that the display actually has RED LEDs, although they look white on this video — it's some artifact of the video recorder I used. Also, listen closely for the sounds the game makes, they are faint because the video microphone was not close to the little speaker. The opening and closing text has examples of the sound too. These guys are great! Besides offering an excellent PCB fabrication service, they have a community outreach program that helped pay for the PCBs for the kids. Thanks guys! A local electronics assembly and service house in Austin, Silicon Hills graciously assembled the boards for the kids. 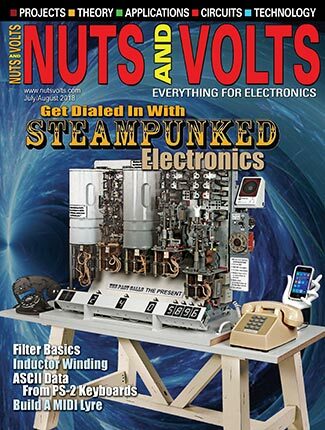 The RetroGame Kit is available in the Nuts & Volts webstore. 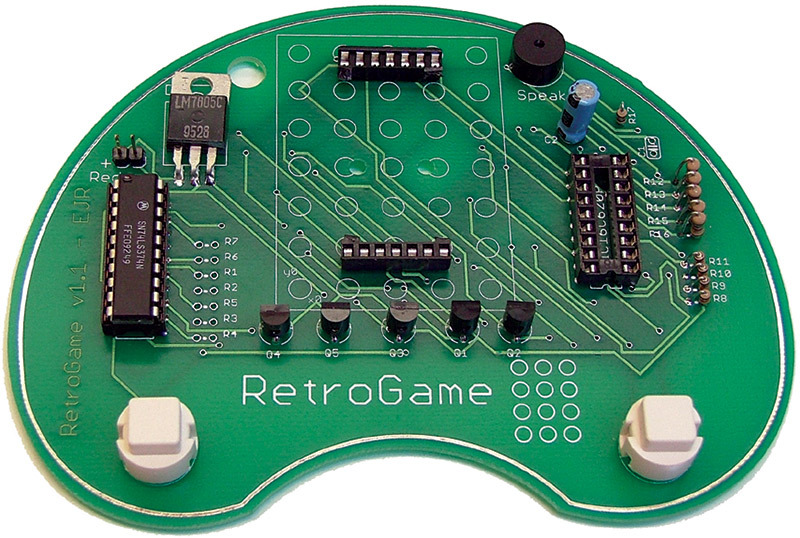 The RetroGame PCB is available in the Nuts & Volts webstore.